Link Detox Boost is a unique technology that helps you recover faster from a Google Penalty. It has a seamless integration with Link Detox® and the Link Detox Genesis® algorithm, and it supports custom Disavow files from other link risk analysis tools. It's proven to work on both Google algorithmic penalties (filters) and Manual Actions. Stable technology tested & approved for years now at your fingertips. The Disavow command to Googlebot only gets into effect when links are recrawled. We make sure that happens fast, and track the progress for you. Link Detox Boost takes away the guess work of “when” the Googlebot will come around. 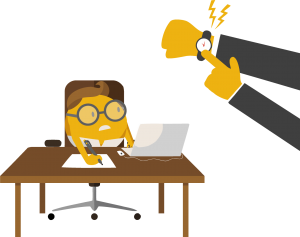 Speed up your Google Penalty recovery and earn your rankings back! We have tested it time and time again, and we even recovered a website in as little as 3 days. Google Penalties take forever! Problem: Google is TOO SLOW! If you are like the thousands of webmasters who suffered from a Google Penalty (whether it was an algorithmic filter like from the Google Penguin updates or a manual action penalty), then you will know by now how frustrating it can be to play the waiting game with Google. Even after you have done everything “by the book” according to Google’s recommendations and uploaded the disavow files, waiting for Google not to count all the bad links that are hurting your rankings can be a very slow and painful process. You have a business to run and waiting for Google is just not an option anymore. Google specifically advised webmasters to use the Disavow tool to clean up and disavow links, but the problem is that Google Disavow does not work fast unless it’s boosted. Even though Google makes this statement, Google will only show 20% of the links in the Google Search Console. Therefore, it’s so crucial to combine as many available data sources in your link analysis.You have to understand that Google is just a machine. Yes, it’s a very large and complex computer system programmed by humans using algorithms, but it’s still just a machine. There are priorities in every machine. And while Google is a large corporation, maybe the largest corporation in the world, it’s still not God. We have seen many Google penalty recovery stories. One of our customers even reversed a Manual Action in a few days. 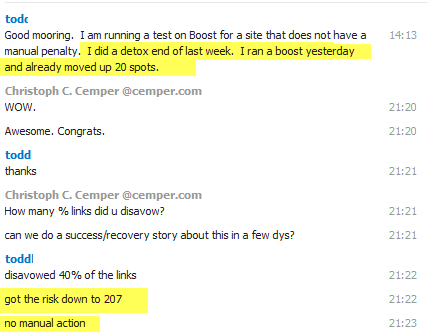 Our customers also confirmed that Link Detox Boost also works on algorithmic penalties. 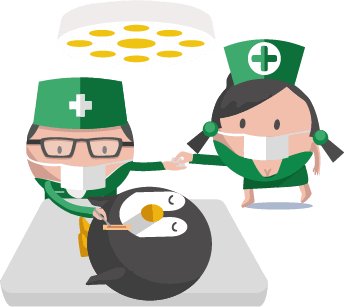 If your site has lost its ranking due to a Google Penguin penalty, Boost will help you recover your website from your Algorithmic Penalty (aka filter). The client disavowed ~40% of his links on Friday, got the Domain-wide Link Detox Risk (Domain DTOXRISK®) down to 207, ran Link Detox Boost on Monday, and had an almost instant jump of 20 positions. Please note: This isn’t a magic wand. You must remove or disavow all bad links for Boost to work. If you don’t, Google will see the same offending links and not remove your penalty. That’s why Boost is only effective when used after a thorough link audit. If your site has been manually or algorithmically penalized, you are losing money every day. What are you waiting for? Get Link Detox today! Whether you built a lot of spammy links in the past or hired someone who has done a lot of dirty SEO work for your site (like forum profile links on some long abandoned forum or link directory), then there is a good chance that these links have a very low crawl rate. That means you will be waiting a very long time before you can see any changes in your search engine rankings. In short, the problem is that the Googlebot is lazy when it comes to re-crawling the bad links you disavowed. Googlebot is very active on high-quality sites that they deem to be high-quality or high-authority, but those low-quality links you added to your disavow file weren’t crawled well in the first place. If you have ever followed spammy link building practices or hired an SEO who did that to your website, then you will know what I mean. These low-quality links will not be detected until Googlebot comes around, and nobody knows “when” that will be. This is why we built the advanced Link Detox Boost tool to help you push the Googlebot into re-crawling the low-quality links you have already asked Google to disavow. The Googlebot needs to re-crawl these low-quality links fast or else you will be waiting a very long time before you notice any changes. Google recommends pro-active link disavow. 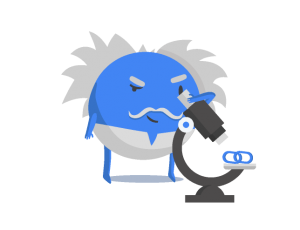 If you have some bad links in your profile today, and you can’t sleep because those links are hurting your search engine rankings and your business, then feel free to disavow those bad links ASAP. Matt Cutts confirmed that in a video. This describes the process of Link Risk Management that we have always recommended with Link Detox and “Round-Trip Disavow”. If you have uploaded your disavow file and your website traffic has not returned to its former glory, then there is a good chance that a couple things might have happened. Either the disavow process is not fully completed yet, OR not all the bad links you disavowed have been re-crawled. This process can take a very long time. Uploading all of the bad links to the Google Disavow tool does work, but the time you have to wait for Google to re-crawl the bad links is painfully slow. You will probably notice that the links are never read even after waiting a full month. If your site has been manually or algorithmically penalized, you are losing money every day. Link Detox Boost can help speed up your recovery.